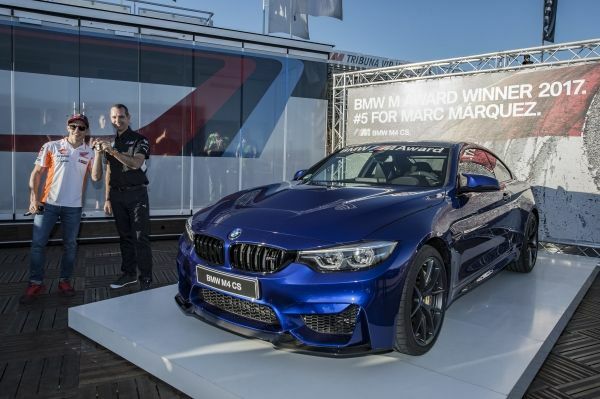 Posted on 14, November 2017 by EuropaWire PR Editors | This entry was posted in Automotive, Awards, Germany, Spain and tagged BMW M Award: Marc Márquez, exclusive BMW M4 CS in San Marino Blue Metallic, MotoGP, The 2017 winner’s car. Bookmark the permalink. 2017 BMW M Award: Frank van Meel, President BMW M GmbH, Marc Márquez, BMW M4 CS. Record extended: Marc Márquez is the fastest qualifier in the MotoGPTM for the fifth time in a row. The 2017 winner’s car: the exclusive BMW M4 CS in San Marino Blue Metallic. Winner’s car presented at the MotoGP season finale in Valencia. VALENCIA, 14-Nov-2017 — /EuropaWire/ — The record holder continued his winning streak in the BMW M Award: Marc Márquez was the fastest qualifier in the MotoGPTM once again in 2017, which saw him clinch the coveted award for the fifth time in a row. The Spaniard won the BMW M Award this season with a total of 343 points and a considerable advantage of 86 points over his closest rival Maverick ViñalesThis year, Márquez was rewarded for his qualifying performances with the new BMW M4 CS (combined fuel consumption: 8.4 l/100 km; combined CO2 emissions: 197 g/km*). The official award ceremony took place on Saturday as part of the MotoGP finale in Valencia, Spain. This year’s winner’s car was presented to Márquez by Carmelo Ezpeleta, CEO of MotoGP promoter Dorna Sports, and Frank van Meel, President of BMW M GmbH. Márquez races from record to record in the BMW M Award. In 2013, he became the first rookie ever to win this prestigious competition. Márquez repeated the success in 2014, and in 2015 became the first rider to win three back-to-back BMW M Awards. His fourth straight win in 2016 made him the sole record holder and this year he continued his historic success streak. This sees Márquez add a BMW M4 CS in San Marino Blue Metallic to his collection of BMW M Award winner’s cars. The high-performance car is powered by a M TwinPower Turbo inline six-cylinder engine, which generates 460 hp and 600 Nm of torque and allows outstanding performance across the full range of engine speeds (combined fuel consumption: 8.4 l/100 km; combined CO2 emissions: 197 g/km*). In addition, the car is equipped with a host of other high-performance components including the Active M differential and a particularly athletic designed M double-clutch transmission with Drivelogic. Other highlight features of this year’s winner’s car are the exclusive alloy wheels inspired by motorsport and the innovative OLED rear lights. The athletic appearance of the BMW M4 CS continues inside the car – from the lightweight M sport seats in anthracite-coloured Alcantara leather to the M Alcantara steering wheel and many more exquisite details. As a long-standing partner of Dorna Sports, this season saw BMW M GmbH present the BMW M Award for the 15th time. Just like the points system for the races, riders at each Grand Prix weekend are awarded points relative to their positions in qualifying. The rider with the most points at the end of the season wins the BMW M Award in form of an exclusive BMW M car. Marc Márquez is the record holder with five wins in a row. Valentino Rossi and Casey Stoner both have three BMW M Awards to their name. Jorge Lorenzo has earned the coveted title of top qualifier twice so far. Sete Gibernau and Nicky Hayden have both won once. *Fuel consumption and CO2 emissions figures are provisional, based on the EU test cycle and may vary depending on the tyre format specified. BMW M GmbH. BMW M GmbH is a 100 per cent subsidiary of BMW AG. With its products and services in the business areas of BMW M Automobiles and BMW M Performance Automobiles, BMW Individual, M Sports Options and Packages, as well as BMW Group Driving Experience, it is geared towards customers with particularly high aspirations in terms of the performance, exclusivity and individual style of their vehicle. Based in Munich, the company was founded in 1972 as BMW Motorsport GmbH. Since then, the letter M has become synonymous all over the world for success in motor racing and for the fascination of high-performance sports cars for road use.